Monday UPDATE UPDATE: Nothing major to note from today's actuals, Noah & Divergent down a tad, Sabotage still tanked. SUNDAY UPDATE: Decently saturated. Delivering the fourth-largest debut of 2014, Noah did marginally better than expected thanks to both the free publicity generated by the "controversy" over its biblical accuracy and – ironically – rain parked along the East Coast Saturday into Sunday. Momentum could be sunk quickly though, the $125M pic received a crummy 'C' CinemaScore, signaling just how polarizing Darren Aronofsky's depiction of the ark builder is. Dropping a respectable -52%, Divergent took second, closing in on the $100M mark stateside. The weekend's other storyline: Sabotage getting smashed to bits, The Expendables wannabe became Ahnold's worst-ever opening when adjusted for inflation. Hasta la vista, baby — couldn't resist. Russell Crowe isn't what he once was. When you remove Man of Steel and Les Misérables from the equation, the Aussie hasn't exactly been money at the multiplex over the past five years. Broken City bombed. The Man with the Iron Fist tanked. The Next Three Days — yeah, I had zero recollection of that one either. But here's the good news for Crowe: his last solo-headlined tentpole to do big business, Robin Hood, feels a lot like the one he floats in on this weekend, Noah. Epic in scope and slightly more action-packed than the tale of the ark builder I was told in CCD, Darren Aronofsky's depiction has gotten plenty of press for its lack of Biblical accuracy; as if giant rock beasts – hybrids of Transformers and those supersized talking trees from The Lord of The Rings: The Two Towers – aren't to be found in the Bible. Puh-leeze. 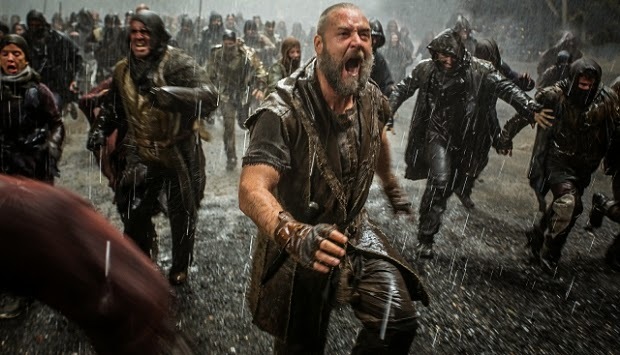 Noah $37.5M (↔) - Aronofsky is guaranteed of one thing: his biggest-ever debut, needs a paltry $3.8M to accomplish the feat. Divergent $22M (-60%) - Front-loaded to the max, should see steep drop in sophomore frame. Muppets Most Wanted $10.25M (-40%) - Kermit got wiped out by the wake of The Lego Movie and Mr. Peabody & Sherman. The Grand Budapest Hotel $9M - Adds 600+ locations after mind-blowing $22K average last weekend. Sabotage $8.75M (↓) - Looks like The Expendables, won't perform anywhere near The Expendables. Also: Bad Words - Jason Bateman's Bad Santa-goes-to-the-spelling bee directorial debut opens on small 842 screens. Cesar Chavez - Less-than-stellar reviews don't aid an already less-than-riveting subject. The Raid 2 - Gareth Evans' insanely-violent, insanely-awesome sequel kicks off on seven screens in NY & LA before wide release in two weeks.